The plot is slowing down, with the beans and squashes starting to yellow. And that means that, instead of watering, plot visits are taken up with harvesting. All bar one of the (enormous!) onions from seed have fallen over and are drying out in the shed. 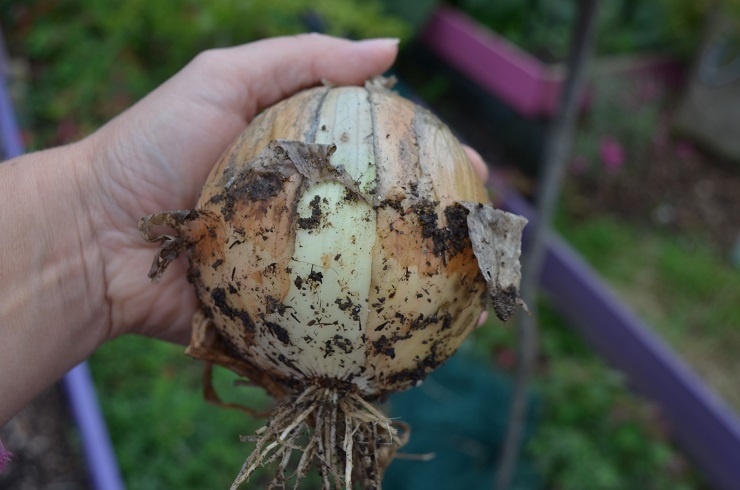 I am so pleased with the result – definitely one to repeat next year, this time with more onions. The tomatilloes have decided to ripen all at once, and I honestly have no idea what to do with them all. Other than not to grow so many next year. There’s been a bit of early lopping of the hedge along my plot to reduce the amount of shade on my beds. I’m being really careful not to cut any branches with sloes on or any of the climbing roses, which I want to weave through the blackthorn. And I have a new pink bed to dig now its sloping path has been levelled. I knew those blocks of wood would come in handy! Hopefully the rain will hold off for a while. I’d love to have it sifted, sorted and ready for potatoes next year. 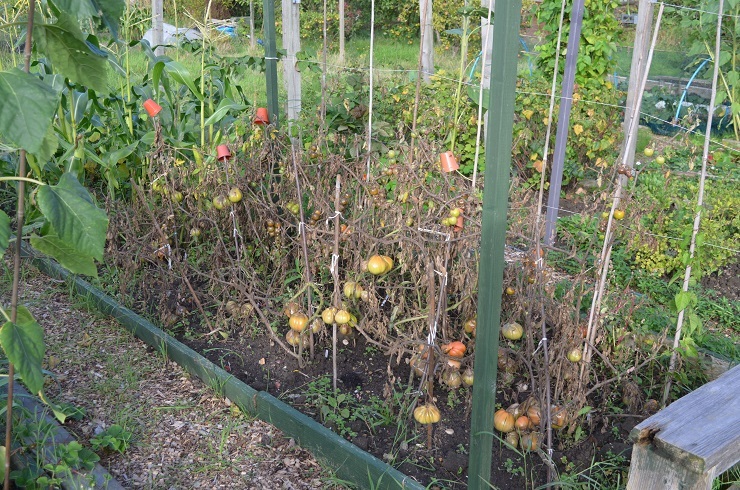 One of the drawbacks to allotment growing is how concentrated diseases become. Next door’s tomatoes were totally destroyed by blight over 3 weeks ago, and they are still there, functioning as BlightSporeCentral every time the wind blows. All my outdoor tomatoes have had to be binned, bar the blight resistant Crimson Crush. I’m not suggesting the blight on my plants came from there, but it really doesn’t help that they’ve been left. And it looks like botrytis might have set up home in the greenhouse. The Red Zebra has some very suspicious blotches on in. I knew it was coming and it will do me good to clear out the plants, though that means we have a small mountain of ripe-ish tomatoes. In a moment of genius I’ve persuaded my friend to take the leftover green tomatoes and convert them into chutney. And then give me a jar or two. Happy days! The tomato mountain will be eaten, sauced and dehydrated. 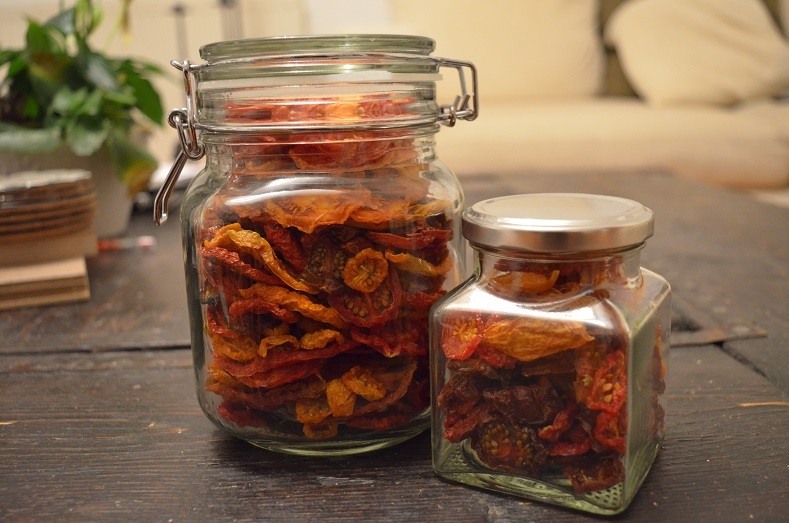 I’ve nearly run out of freezer space, so being able to dry tomatoes is a big bonus. 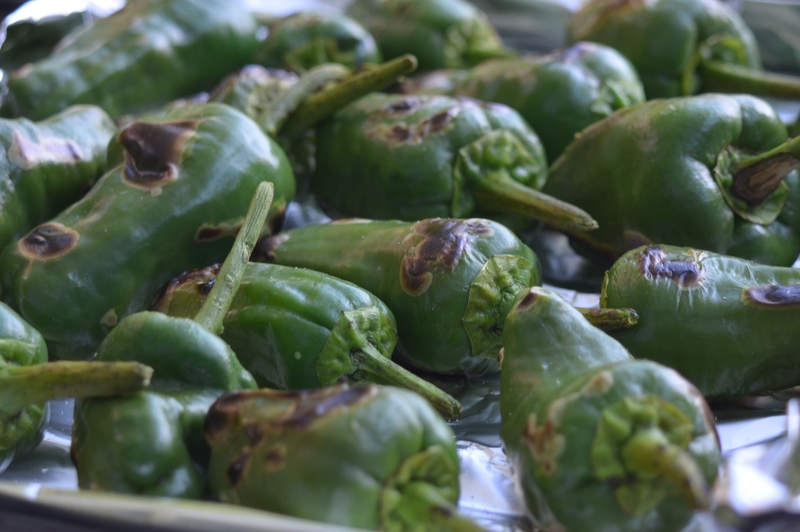 They look odd, but they taste incredible, either plain or sprinkled with some salt and oregano. The only real issue is that I need to hide them so Someone (not me) doesn’t snaffle them all in a couple of weeks. PS Top tip for saving tomato seed: carefully choose the best tomato, put it in your fleece’s pocket to stop it getting mixed up with the others, forget it’s there, then feel it explode as you bend to pick kale for dinner…all the seeds will be handily arranged in the inner lining.